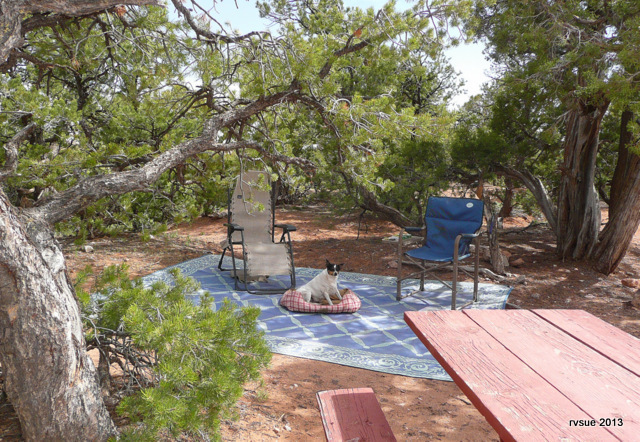 ← Navajo National Monument and a paradise camp! I peer out the window over our bed to watch the sun rise. I’d like to go outside to our personal look-out ledge to view the canyon, but I don’t want to disturb the canine sleepyheads. Gee, all the excitement of a new camp wiped them out. I let them rest a few minutes longer. Finally Bridget and Spike wake up and stagger outside. I sit in our outdoor room and drink my morning coffee. 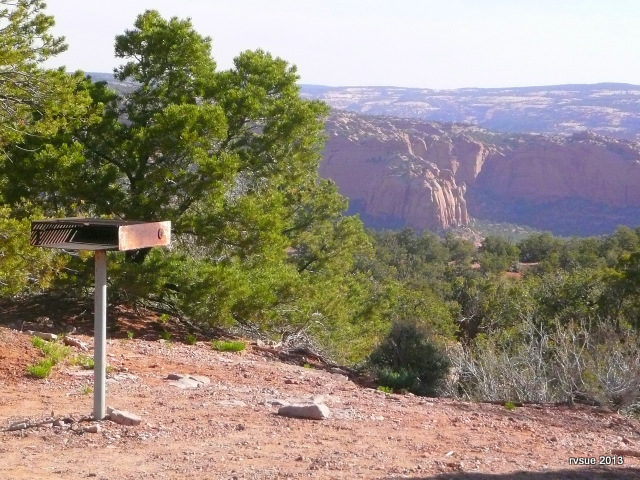 No one is here at Canyon View Campground at the Navajo National Monument. Just me and my crew. I let Bridget and Spike enjoy no-leash freedom. Yes, I know, dogs are supposed to be on-leash here. “If a tree falls in the middle of a forest, but no one is around to hear it fall, does it make a sound?” Well, if a rule is broken and no one is around to complain, does it matter? So there. We nose around the empty campsites. 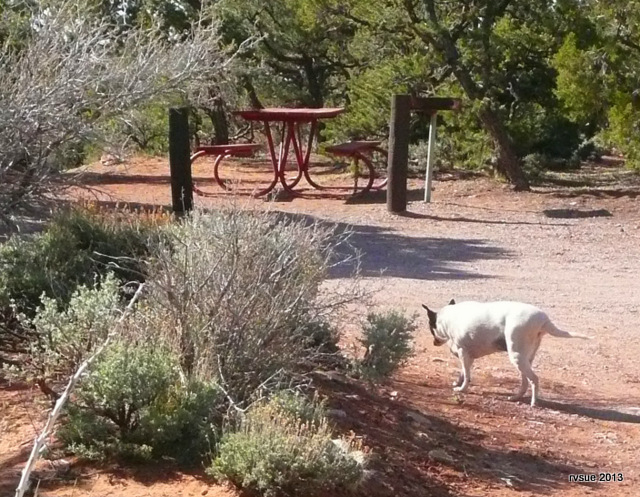 Almost all the campsites have easy access to the canyon view a few steps from the barbeque grill. I change my plan to photograph the canyon this morning. The canyon is east of us and in shadow. The picnic tables may need a fresh coat of paint and the grills are a bit rusty, but natural beauty prevails. This campsite is an easy pull-through. Bridget and Spike walk nicely together this morning. 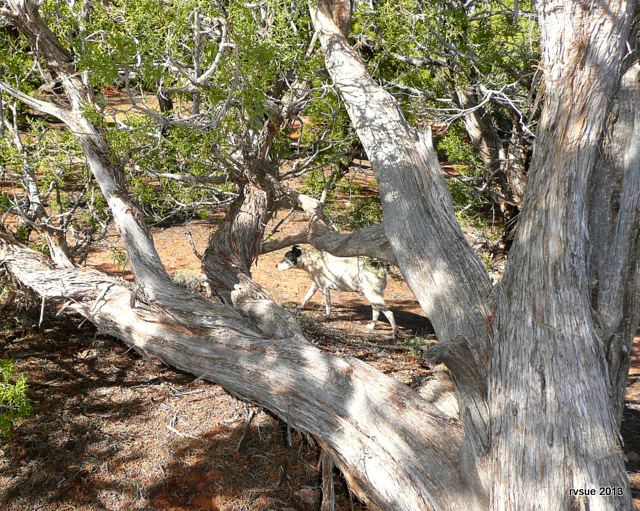 The campground has numerous paths through the cedars, and the red-sand ground is soft for paws. Spike is a good boy and doesn’t perform his usual disappearing act. Could it be this place has a calming effect? We are very reverential this morning. 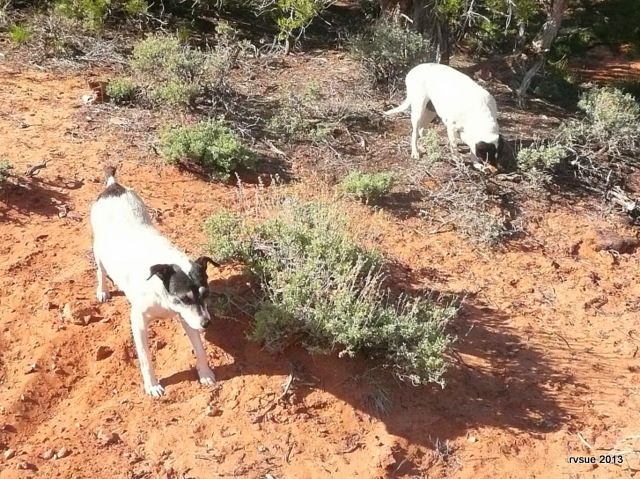 Spike pauses while Bridget sniffs around the sage. Every day should begin this peacefully, drifting in and out of sun and shade . . . Living in the moment . . .
Bridget leads the way back to our campsite. We’re home! Another day has been welcomed. By afternoon the wind is strong and gusty. Therefore, in order to protect my camera, I postpone taking photos of the canyon. I sit in my camp chair with my field guide to western trees and tentatively identify the pretty evergreens around our camp as Utah cedars. When my hat blows off for the second time, I go inside. Bridget and Spike follow, get in bed, and promptly drop into slumber. I, on the other hand, gather up April receipts and set to work. I’m pleased to announce that . . . The April financial page is done. Time to eat! 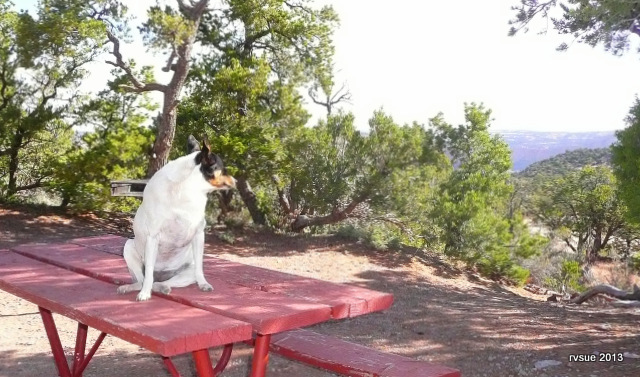 With my Utah Benchmark atlas in my lap, I research adventures for May online while munching a cheese sandwich, shared with Bridget and Spike, of course. Gee, I’ve said it before and I’ll say it again. It doesn’t get any better than this. 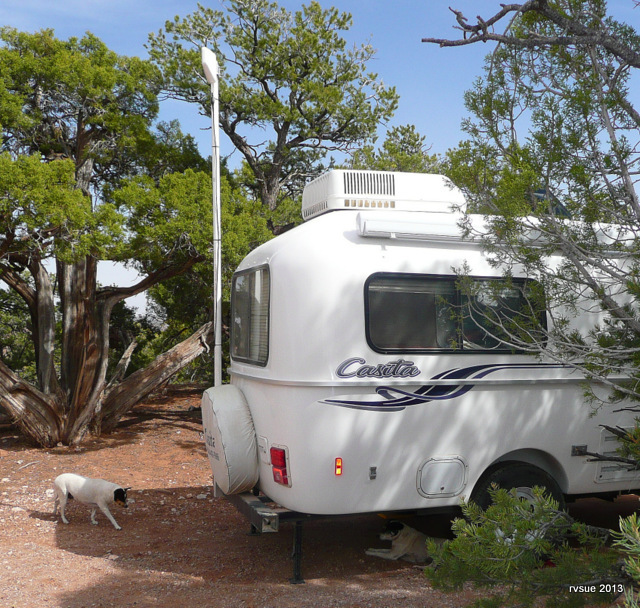 This entry was posted in Simple living and tagged Arizona, Canyon View, casita, frugal living, National Monument, nature, Navajo, rat terriers, RVing, simple living, Southwest. Bookmark the permalink. Ah, yes, bliss in our lives. A rare event and one to be cherished – enjoy! Bliss . . . great word. I should’ve used it in this post. As long as you’re sleepy in relaxation from reading my blog… that’s okay. This looks like an awesome campsite! Cant wait for more pictures. More pics are on the way! I am getting so so so excited to do what you are doing! It is gonna’ happen….simplify, sell all, take off with the dogs (and bird), take a dose of “you can do it” medicine….and boondock my life away! What an inspiration you are, Sue! You’ve written the formula perfectly . . . Go for it! Love the pictures of this campsite, so cozy looking. No nosy cows to alert Spike, no wonder he is calm! You’re right, Mary. 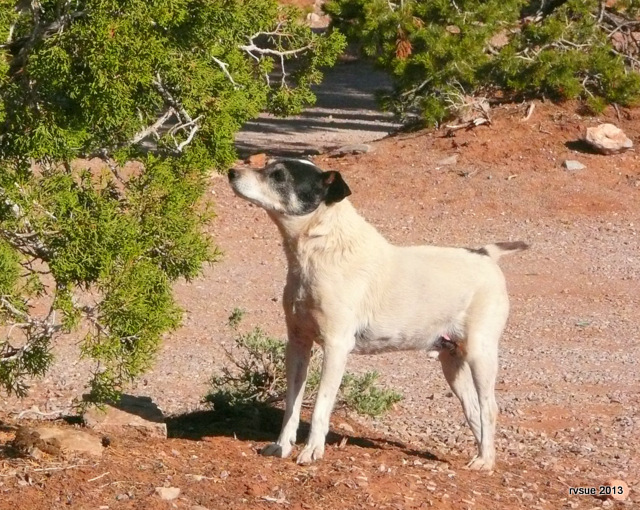 With no menace to drive off — bovine or otherwise — Spike can stop and smell the . . . sagebrush. looks beautiful! I can’t wait to live the lifestyle. Less is truly more. I hope you can get on the road soon! The first two photos shared such a sense of tranquility….I want to be there!! And then the shots of Bridget and Spike…just adorable! If only they could speak … how happy they must be! I’m glad you enjoy my photos. And I’m also glad that Bridget and Spike don’t speak and ruin the silence. I think Spike stays closer to me and the Bridge now that his eyesight and hearing are poor. It makes me sad. But on the bright side, he has become more receptive to affection. When he was young he’d hardly let me hug him… too mushy for the guy. Again the views are beautiful … but for the life of me I don’t get that kind of remote camping. BUT there are a lot of things I don’t get. I would be okay … with the quiet and the gorgeousness of nature until the sun left. then. katy bar the door… sounds. WHAt’s that .. I calm me down and promise the universe that if I lived through the night … I would never do this again … never. I thought I didn’t sleep but I woke up so I did and saw gorgeous sunrises and made coffee and smelled that wonderful air and declared… I would do it just one more night. But then I didn’t do this often … I lke Panera Bread and little diners and much to my fat cell’s delight … bakeries. I guess why I’m writing this essay is to … I know you have the dogs and have boondocked like this for a long time … ask that when it’s pitch black outside .. do you ever get the boogieman thoughts? Never! I never think about boogiemen or serial killers or robbers or any of that stuff. Readers of this blog have written that I have angels looking out for me, or that I have “all the luck.” I think it’s because I don’t seek the bad through my thoughts. I’ve lived through very negative times in my life. I’ve learned to let go of fear and I never fret about “what might happen.” Why torment myself with that? That is so true Sue, Fear attracts Fear! JOY attracts JOY! 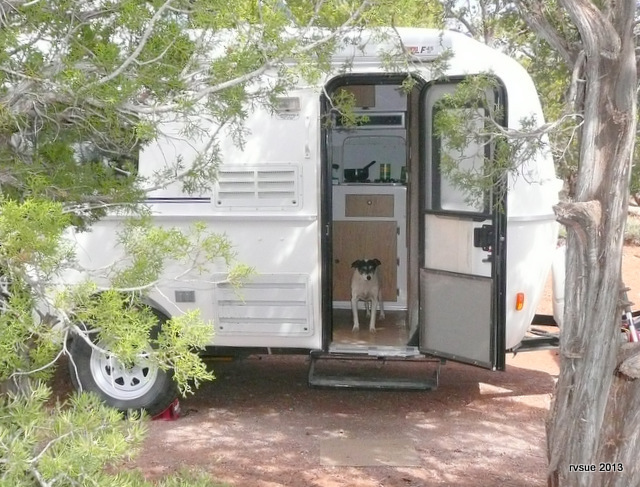 I am much more afraid of city living than country boondocking! You are in a very beautiful place, both physically and spiritually. Thanks for sharing that kind of peace with all of us! You’re welcome, Geri. Nice comment. Sue, I also have wondered if you ever get afraid being so remote and alone. I’ve wondered how I would feel. But I have also camped alone in very remote areas and was not afraid. My feeling is that I’m much safer out in nature than in a city. The one time I stopped at a place and I got a feeling that the place wasn’t safe, I moved on right away even though I didn’t know of another campsite and ended up staying in a rest area. I found out later that there had been problems at that campsite so I was right to move on. Following your instincts is always right. Here’s the distinction I make: Fear is an instinctive reaction to a perceived threat. Apprehension is an intuitive, uneasy feeling. Since I don’t perceive any threat, I have no fear. I have had episodes of apprehension. I blogged about such an episode when I could not bring myself to drive into Yuma because I intuitively sensed it would not go well. You experienced apprehension at that place you left, not fear. I know my name ain’t Webster, but that’s how I define those words. Actually, that is a great distinction. I’ll have to remember it. well? I kinda pride m’self on not being a fearful person. I don’t entertain fear. What I do … is pay attention to the way I feel about a certain place. I do this when I’m city boondocking or any kind of boondocking or camping – or driving or walking in unfamiliar areas. Just a feeling ~ unsolicited ~ because I like it all…. well, not remote camping though. I’m not trying to promote my blog … I don’t do ads or such. BUT this post brought back my sissy wimp post … if you would like to know how us sissy wimp’s fly… ? I read your blog post. You do realize that your fear of the dark is irrational? Half your time on this earth is nighttime. When fear is conquered, darkness is soothing. It gives the visual sense a rest. I prefer remote camping because I enjoy the company of myself more than the company of others. It isn’t the dark … I love no light and gorgeous star watching … it’s the remoteness in the dark … no cell service ! I truly could not see my hand in front of my face until the one back window … just a bit ~ not THAT dark and remote. Thatsa different kind of dark, to me. I don’t mind my company at all~ I have a grand time by myself, HOWever, I do bore myself at times and need fresh blood. Carolyn, you are funny. As much as you enjoy the outdoors I am surprised you get scared in the wilderness. I feal like the farther away from city and town you are the less likely that some wierdo will come by. I mean they dont go out in the boonies looking for people. I love being alone camping. In fact, maybe to much so . haaa Hi Susan … well? I like it all.. you’ve read my blog here and there. surely you know the silly situations/places I’ve gotten myself into… I am most familiar with cities … I understand the dangers … the wilderness? not that familiar and don’t have the desire to learn it well enough to camp there for any length of time. I have spent sunup to sundown exploring wilderness areas … got myself into many a pickle on dirt roads and washed out roads and animals and fallen trees and even desert stuff. Desert stuff as forest stuff can be really claustrophobic … you know what I mean? I like to know where I’m going to spend the night by evening time … and there were many many times I spent too long at the fair and ended up in some pret ty weird places. I’m a freakin sissy wimp on some stuff. I’ve written how damn near perfect I am but … there are still some areas that might need a little work ~ but NOT in the dark in the wilderness. I’d rather be parked on a busy city street in front of a hotel than out in the middle of nowhere … just the way I’m drawn. Natural Bridges Nat.M. is just up the road and when you’re done with desert and dust you’re a hop, skip, and a jump from the pondees in the Colo. Rockies. You could spend a summer between Dolores and Pagosa Springs. If you need any boondock sites I can send you a few ideas. Promise, no where near US 550 out of Silverton and the cliffs to nowhere! I’ve heard about that awful road! It must be terrible to have such a reputation. I’m not doing the Colorado Rockies this year, but they are on my list. I was looking at Natural Bridges while doing research today. Wish the MotherShip would fit in there. Beautiful site! Several of the sites in Canyon View are big enough, but there’s no place for a big rig to turn around to get out. All it would take would be a bigger loop at the end. As it is now, the road ends at a tiny loop around and through trees. Oh my —I love your campsite! Oh I knew you would! Oh what a site! Bridget on so many pics in one day! So much for our nice sunny days. Expecting snow tonight and tommrw, their talking a foot. I can’t believe this. Trip to the dentist has made for a miserable night. Going ADVIL hunting. Enjoy your peaceful beautiful site. Well, Kay, at least you have that dentist visit behind you. Now to deal with the pain . . . I hope you sleep pleasantly tonight. What a cozy little spot you’ve found! I feel like I’m repeating myself…because ALL of your sites are wonderful. Funny to see Bridget on top of the table. Spike has a bit of a red tinge to his fur. But they both look like they are enjoying life! Bet Spike is getting the urge to soak somewhere. He’ll know when you drag out the canoe. Southern Utah is gorgeous. Bryce Canyon, Moab. Natural Bridges. Are we there yet? There is a travel advisory (damage/partial closure)for US 89 south of Page AZ…so heads up. Yes, as we headed north up 89 there were flashing signs for the detour around the part of the highway that fell away last February. I saw a lot of trucks on the alternate route to Page (Hwy 160) which was a very long detour for those truckers. Bridget on the table . . . posed by me, not a natural habit of hers! I can feel the peace and tranquillity all around you and your crew – what a beautiful place to spend time! I laughed at your comment about the rules – my guiding principle is that it’s easier to ask for forgiveness than permission, and it’s only illegal if you get caught. Maybe not the best philosophy, but it works for me 🙂 Enjoy your solitude. I used to be an excellent rule-follower until I realized the other people were the ones having the fun! Seriously, most of the time I’m a good girl. 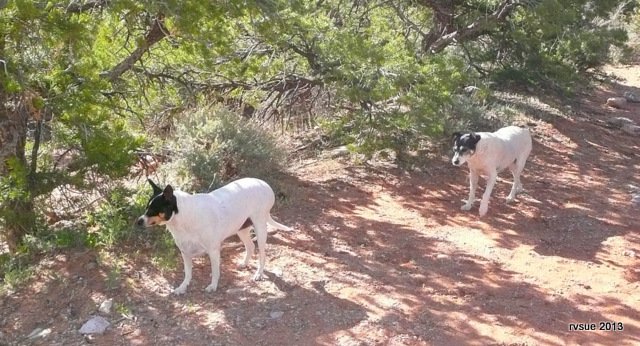 Putting leashes on the crew changes the mood of the walk… puts a hierarchy into the relationship or something. I know, weird. It must have a calming effect there, in order to get Bridget into so many pictures! I happened to pick up the latest issue of Motorhome Magazine today, and they had an article about Kodachrome Basin State Park in Utah (about 20 miles or so from Bryce Canyon Park). According to them, it is not as well-visited as the others in the area (suspect that will change now that the article is out! ); might want to check it out. Utah is an incredible state… National Parks, natural wonders, everywhere! I’m limiting myself to one or two National Parks a year. More than that and I’m overwhelmed with sensory overload. Hello, Florine! Great to see you appear here . . . It’s my pleasure to share my life and the life of my crew with you. Two things I’ve dumped out of my life . . . fear and worry. Wow! Life is beautiful once those bugaboos are thrown away. I wish you the best ridding yourself of the vestiges of grandma’s fears. Thank you for letting me tag along via computer. I look forward to the canyon photos! You’re welcome, Katy. I know how it is to be in the armchair. I’m hoping the wind stops tomorrow so the crew and I can go on a hike and I can take pics of the canyon. 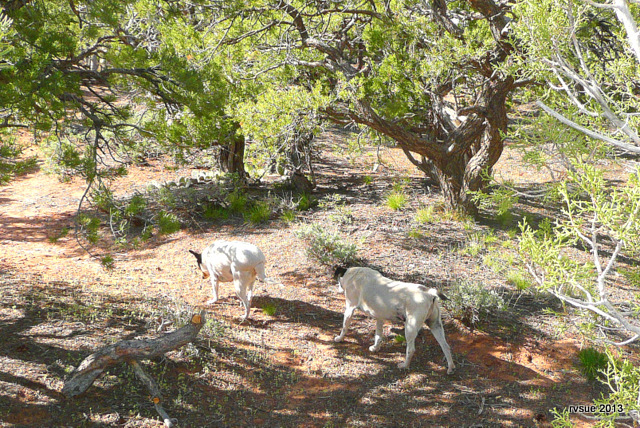 I think the leash law was intended for crowded places…so why not let Spike & Bridget roam free…there’s no one around but you, the trees, the canyon and maybe other critters. Your camp site reminds me of when I was little we’d camp in a hollow of trees…it broke the wind, cold & heat. We mostly traveled on foot with a couple of pack horses to the camp site but sometimes we used a wagon. Back then the whole place was alive with vegetation of every variety, butterflies, birds and insects. The nuclear test down wind killed everything….flowers are gone, butterflies, and birds all gone. It also killed a lot of animals and people..in the form of cancer. We drink bottle water not bottled in the local area but far away from Navajo rez. In some areas it beautiful but deadly with nuclear waste that have not been cleaned up…I think they are marked but not sure. It’s sad. Enough of that….there are beautiful areas where you are headed so enjoy. Every time you recall a part of your past here on this blog I’m intrigued. Camping with pack horses . .. camping in the hollow of trees. . . Quite a childhood memory! Yes, Rita, a lot has changed in our lifetimes, both tragic and good. wow, Rita. hollowed out trees with pack horses? the nuclear test? around Phoenix? good lord… have I lived under a boulder? Don’t suppose you’ve written down your life somewhere… ? Carolyn, I am Navajo & grew up part time (mostly summers) on the reservation. Nine months of the year I was away in boarding school far far away from home. Now at the ripe old age of 67 I live in comfort in a small bungalow in Phoenix. BTW, I love your blog. I too am fearful of dark and being alone in wilderness but if I have too I gather up my courage, plan my defense if I have too and then relax. Rita, thanks and what an interesting background you have! and well, now see you’re a seasoned camper and that wilderness dark is scary for you too… it’s soooo dark! yep.. plan my defense. What a wonderful outdoor room! You certainly out did hit the jackpot with this spot. Glad the crew is so comfortable. Of all the places you have stayed, I think this is my favorite. A must see visit in the future! My wife and I live in Oregon! Sorry it was so rainy and crowded for your visit last summer. We love forests and mountains, but this spot with a view of the canyon is really terrific. And thanks so much for the financial statements each month. We may be able to “hit the road” next summer. No need to apologize for Oregon. We had a wonderful time there. Every day was a delight. I appreciate the feedback on my money pages. You’re the first to mention it today. I was starting to wonder if anyone cared about it! I hope those figures help you with your planning. Hi RV Sue… I’m not sure how to reach you “off-blog”, but I have a question about the trainer that is working with Timber. I own a pet-sitting business based in the Surprise area (south of Wickenburg off 60), and one of my clients had a stroke that left her on the floor for two days. Her Jack Russell, Jake, finally got the lever door open and ran for help! It would be absolutely wonderful to find someone that could work with Jake as an assistant for my client, but funds are an issue. Do you think the trainer in Prescott might know someone in Surprise?? Thanks for your help, I really enjoy reading your posts almost every day! I’ll ask Rusty to ask the trainer when he meets with her again on Monday. If the trainer knows of anyone available to help in the Surprise area, we will let you know. Regarding their sign prohibiting anything over 29′, total length, that seems to be an impossible goal for anyone w/ a toad. Could a 27′ C + toad (about 42′ TL) get in there? Would the owners care? It’s over 28 feet, not 29 feet. I don’t know who would care, except you if you got in here and couldn’t get out. If there are two of you, you could park at the Visitor Center, unhook the toad, and then drive up separately. Reverse the process on the way out. Then you’d be 27 feet and 15 feet. I’m not comfortable telling anyone “sure, you won’t have any problem with your rig.” You’re close with 27 feet. I don’t know how wide your rig is and if it would be scratched in the turn-around at the end of the road. I’m thinking along the same lines as JC Lewis. Your total length must be approaching 40′ Did you unhook the PTV from the Casita to scout out this road before traveling past the 29′ sign? However you did it it was SO worth the trouble to find this paradise! You are brave! P.S. I love your blog! On Saturday I will be traveling to Chilliwack BC to pick up my new to me 17′ Escape trailer with which I hope to rejoin the full-time RV crowd after a 3 year hiatus in Oregon, Your escapades have given me the confidence to get back on the road in a smaller,greener footprint which I hope will suit me as well as it has suited you. Thank you for so generously sharing your experiences. P.S. #2 This is a bit off topic but I’ve been wondering about your cell coverage when out in the boonies. When you erect your antenna in weak signal areas are you ever able to get a strong enough signal to stream videos? This is SO FUNNY! When I passed the 28-foot limit sign, I never hesitated even though the PTV is about 17 feet long. As a former math teacher, I could’ve done some math. Duh. 17 plus 17 equals 34 feet! I just kept on motoring down the road, confident the PTV can handle any situation! ROFLOL!! No, I didn’t scout around at all. It’s a wonder I’ve made it this far, running around clueless! Hahaha! Seriously though. . . There’s a difference between 40 feet of solid motorhome and my set-up which “bends” in the middle. Oh dear, I’m still laughing. My sides ache. “Oh no, you’re too long to come up here!” Meanwhile I drag my 34 feet up and around this campground, oblivious to possible consequences. Oh man. And you read my blog to learn from my experiences? Okay, about signal for streaming videos.. . I don’t stream videos as I don’t want to use up my data. I look at youtube once in while. The antenna is great, but I can’t answer your question from experience. Congratulations on your new egg-on-wheels! How exciting for you! What a TOTAL GEM of a place you’ve found. We looked at that campground on our way up, but sadly couldn’t fit “the beast” in there. Can’t wait to see more pics of the place. I took the road to Navajo National Monument hoping I’d find an empty site to spend the night. I don’t like driving long distances and the drive from Sunset Crater to here was plenty long enough for me. As you know, the next place to camp is Monument Valley. It was quite a surprise (and a relief) to find a site available here, as well as all the rest of the campground! Your second photo looks so idyllic! So peaceful and calm. Just the type of place I would love. Can’t wait to see some of the views around there. Love the peacefulness of this whole post. And P.S. I’m always grateful that you post your finances each month. I do pay attention to them and refer to them a couple times each month. It’s always a good reminder that I could actually do this! P.P.S. Wow, your income from Amazon for the month of February was really good. That also gives me great hope. I’m glad you find my money reports helpful in planning for your own life on the road. I write a summary of what we did that month to go along with it as I feel it makes the figures more relevant for people. Thanks for the feedback, Donna. 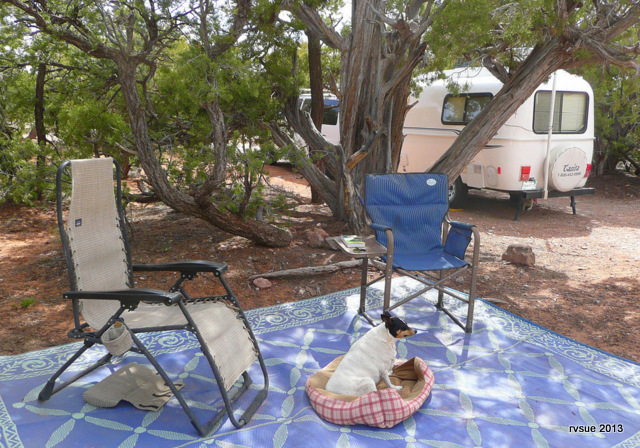 Sue, thanks for checking out Navaho National Monument and posting the campground report. That’s one of the places we’re planning to go after we leave the Grand Canyon North Rim and I wondered if the campground was any good. Now I know it is and hope it’s not full in June when we go. 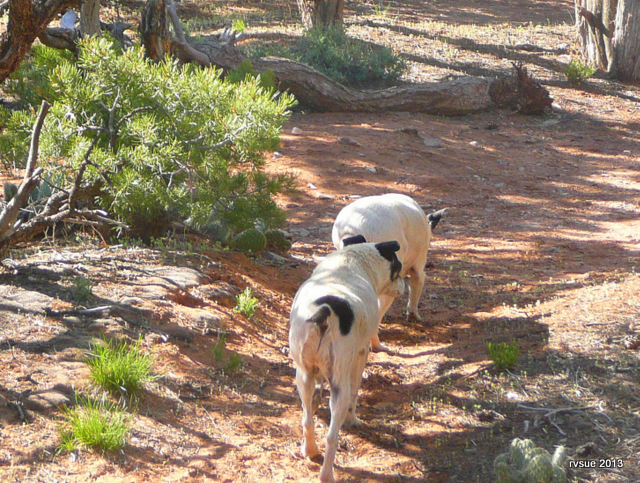 Now if you’re really accommodating you could go to Natural Bridges and give us an advance report there, and then to Canyonlands Needles area and report back. 🙂 However, since you’re not our personal travel consultant I guess we’ll just have to see for ourselves unless those are really places you WANT to go this year. We are soooo looking forward to heading out in our Casita next week. Our kids house sit so we can travel and enjoy. You have a great adventure planned. I know you and Paul will have a wonderful time. As long as the pups are happy and not getting into trouble, who needs leashes. Rules are meant to be bent, if not broken, is what I always say. Too many rules in this life anyway. The crew doesn’t mind the leashes. In fact, they get excited when I bring them out with their black suits attached. The excitement may be from the prospect of me taking them for a walk, instead of staring at the laptop monitor! I do know they enjoy being off-leash. 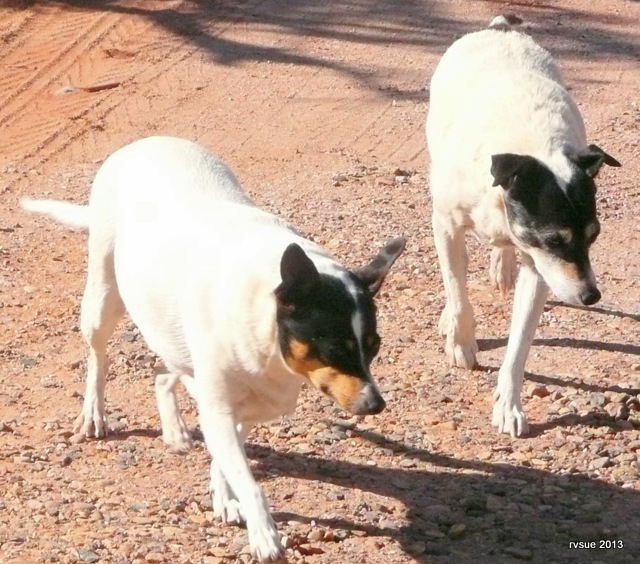 Bridget becomes very self-important leading us home, and Spike can lift his leg wherever he so desires. That’s canine happiness in a nutshell! Great bunch of pics Sue, such a lovely spot. What is the maximum time that you can stay at your present campsite. If it is say a couple of weeks can you move to another camp site in the same area or do you have to move right out and go else where. That’s a question I have, too. I’ll ask at the Visitors’ Center. 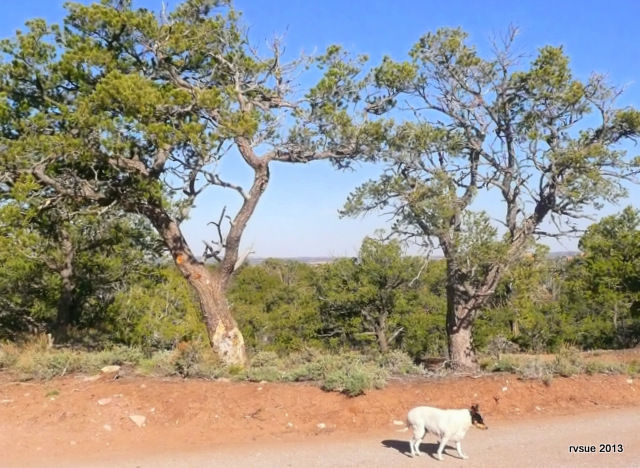 At BLM and National Forest sites the time limit is usually 14 days in any 28 day period. (You have to move at least 25 miles away.) This is a National Monument. I remember Agua Fria National Monument in central AZ allows free camping for 14 days, but that’s dispersed camping with no facilities or amenities, unlike Canyon View which is a campground. I’ll try to remember to report back when I find out. Yes, that’s my boy, Spike. I like that picture, too. Ahhh Beautiful…love your out door room, surrounded by the trees. Serenity! I chose this site mainly for that shady spot and protection from wind. The dappled light on the outdoor room adds to the tranquil feel. this wonderful campsite just exudes peace and beauty. i can’t tell if bridget is truly appreciating the view or if she is doing her looking away from the camera thing (maybe both?)! Your guess is as good as mine as to what goes on in Bridget’s head! Ahhh, the natural beauty of Bridget on the table. :o) What a beautiful camp site! I so enjoy your blog and remarked to a friend yesterday how I live vicariously through you. And you and your financial reports are so encouraging that I too will be able to do it – one day soon. Counting down the days to retirement. I’m planning on modifying a cargo van so that I can do it financially and also get into all the tight spaces that bigger rigs can’t go. Thanks so much for sharing your life – the good, the bad, the financial, and the encouragement. And I love your crew. I lost both my crew this year but will be rescuing again soon. 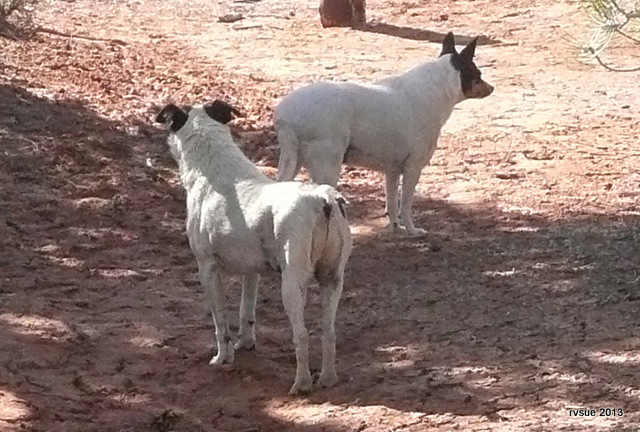 My female looked a lot like your crew, only she was a puppy mill breeder I rescued and she learned how to urinate by following my male around. So the chubby little girl lifted her leg to pee. Very entertaining. Thanks again. I can tell from your plan to modify a cargo van that you’ve got what it takes to be successful at vagabonding. You’ve thought about where you want to go and have chosen an appropriate rig to suit how you see yourself living on the road. There are a lot of advantages to a cargo van! Last night I was thinking about the topic of worry which came to mind after reading comments here. How does a person get rid of worry? The number one factor is living below your means. In other words, don’t live larger than you can afford and don’t covet stuff. I, like you, want to live within my budget, thus eliminating a major source of worry! I am so sorry about the losses you’ve suffered recently. It must be very difficult. Our pups are so precious, and your “chubby little girl” must have been adorable. I’m glad my blog allows you to lead “another life” until you can match or exceed mine with your own! I sure do like that spot for camping. Lots of trees. Sue, how many followers do you have ? I have been researching what I want to get. RV or tow vehicle and trailer. Was just reading that because of possible sway in trailers, animals are not allowed to ride in the trailer. I have 3 cats. So, back to looking at RV’s and maybe a little motorbike to hook on back . My question is , do you notice much sway? Do things get moved around in your trailer? I guess I had not thought about it before till I looked it up on rv forums as to travel with cats. No, I haven’t noticed any sway at all. (I always tow with the sway bar on.) As far as things moving around . . . No matter what rig, you’re going to have to secure loose items. If I were to stay on smooth roads and highways, things wouldn’t move much at all. However, I go on steep grades, uneven, curvy roads that tilt us to the side, and bumpy, rocky roads. I put some things on the floor so they can’t fall. I haven’t thought about travel with cats and that they are not “allowed” in the trailer. I’m curious who says they are not allowed. If I were a cat owner, I’d still want my BLT and I’d put the cats in crates in the tow vehicle when moving down the road. Re: motorbike… My question would be: Why don’t more RVers have them? I wouldn’t want to ride a motorbike on the gravel/dirt roads I usually camp off of. Just something to consider . ..
Good luck finding what works best for you! Hi Sue, When I was in my RV it seems that things rarely moved around . I also went off on dirt roads a lot. As far as a motorbike. I would most likely just stay put and hike around when I am way off on dirt roads but a motorbike might be nice for when in campgrounds that are near to town or other sights that you can then go to via the motorbike. I lived in an rv for 2 years before and since it was only 20 ft. I just kind of drove it like a car. However when I went off the beaten track to places like you are at now, I pretty much stayed till I was tired of the place with no need to drive anywhere. So, it worked for me and I had a bicycle. 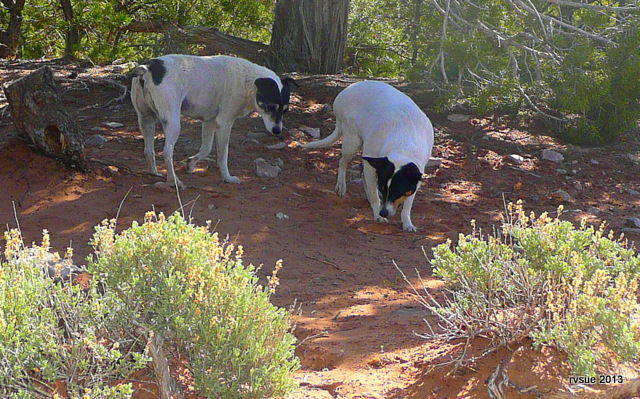 Some of the forums say that it is agianst the law to lv animals in your tow trailer in some states. I need to further research this . Am still planning to go fulltime but maybe not for another year. So, am in the thought process right now of what will work best for me and my crew ( 1 dog and 3 cats). Also, in my thought process is how to make some money on the road. I realize you have to have LOTs of followers to make money off Amazon like you are doing. That is great that you can do that! I meant it is against the law to leave them in trailor while driving !! The reason I have to put things on the floor is this: One side of the BLT is storage drawers, two drawers high. They just sit on the fiberglass channel that runs along the side of the aisle. I could have them securely mounted, but I like being able to rearrange them and also to remove them for cleaning. If I had left the BLT in its twin bed configuration, I would hardly have to secure anything, just the obvious like windows and put dishes away. You camped a lot like I do… Find an interesting, pretty spot and stay put, except for exploring on foot. Before I hit the road I wondered if I would miss a 4WD. I don’t. Bouncing around on back roads doesn’t appeal to me. Storage space in the PTV is much more important. Wow! What a Great Looking Campsite! All to yourself, very Relaxing for sure. I have visited 49 of the 50 states in my lifetime plus Mexico and Canada, but I’ve always lived in southern Arizona. So your desert camp sites, though familiar, don’t attract me as much. I’d rather go explore your home state of Georgia, or Washington, or Maine again. And doesn’t that make perfect sense? We SHOULD all go someplace new, and expand our horizons beyond the places we have lived. I have 4 years to get ready, but I’m already dreaming of my Casita. And then… OH, the places I will go and sights I will see!! Hello Sue – have been following your adventures a long time now. I have a question about your wifi antenna – – would you get a stronger signal by going up 20 or 30 feet? Just curious. The pictures you have taken for this post are so beautiful and relaxing. They are just where I’d want to be. Sometimes I wish for that type of life. Today was one of those days. The beautiful energy of this place shines through in your pictures. No wonder you feel at peace. You walk lightly on the land and the spirits of the place are happy with you. I know that sounds a little woohoo but I have felt that in several places we’ve been.